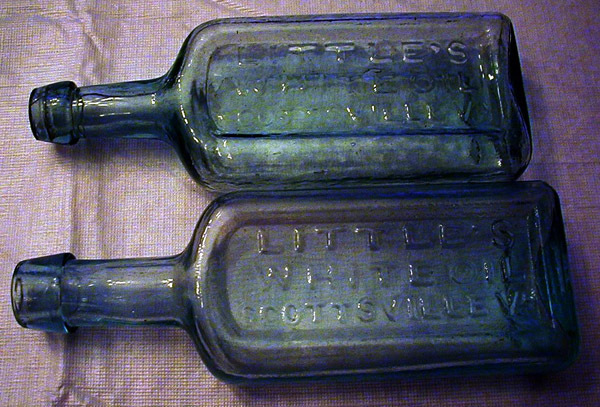 Comments: Shown above are two bottles that were once filled with Little's White Oil, a patent horse liniment compounded and patented by Theodore Wallis Little of Wayne County, NY. This liniment was manufactured and sold by the drug business established by Theodore with his brother, Charles Ebenezer Little, between 1837-1866. During this time period, Theodore also traveled extensively, especially to southern states, to establish agencies for the sale of this liniment in 23 states. 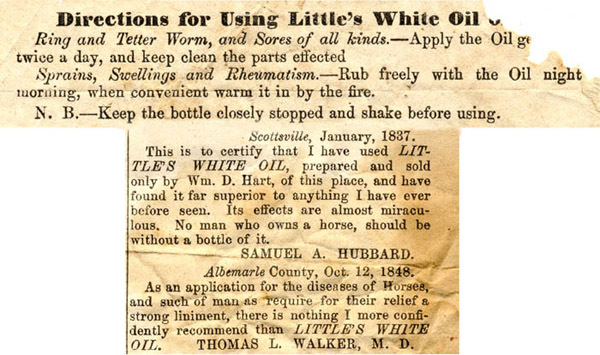 In 1837, Samuel A. Hubbard of Scottsville, VA, provided a glowing testimonial to the 'miraculous' effects of Little's White Oil; see his testimonial in the next paragraph. It's possible that during his marketing travels through Scottsville, Theodore noted the multiple shipping options available to businessmen in Scottsville as provided by the James River and Kanawha Canal which went through Scottsville. Additionally, wagon trains from the Shenandoah Valley regularly brought farm products to Scottsville for onward shipping on the canal to Richmond markets. These wagon trains then reloaded with manufactured goods, shipped from Richmond on the Canal to Scottsville, and transported these goods to the settlers in the Shenandoah Valley. Such shipping options would have proven a boon to a businessman in Scottsville. In 1842, Theodore moved to Scottsville where he engaged in this drug business with his brother, Charles, until the end of the Civil War. From a trip of 200 miles in the month of June, my horse became very galled, his shoulders and back extremely sore. On his return, I was advised of your WHITE OIL being a sure and speedy remedy. Having to take a trip immediately to the Virginia Springs, which I did, starting from home in very warm weather, about the 25th of June, I confess that I had very little faith in its benefitting my horse under the circumstances. I nevertheless procured a bottle of your OIL, and persisted in the use of it during the trip, and to my astonishment and gratification, in four or five days, my horse's shoulders and back was healed, and I hereby confidently recommend it in similar cases. I have been using your WHITE OIL for some time on my horses with entire success, and I determined to use it on my boy's leg which was broken a few days ago, and the result was that it reduced the swelling almost instantly, and made a cure of the leg in much less time than usual. In fact the boy was walking about in three weeks. I thereby cheerfully recommend it as the best remedy I have tried for diseased horses, as well as for pains and swellings on a man. 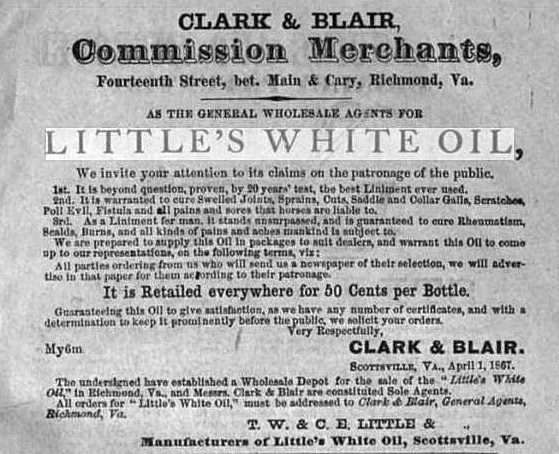 The Little brothers were very successful in the sale of Little's White Oil through the 1840-1860 time period with sales in twenty-three states. However, with the outbreak of the Civil War in 1861, their sales of this product were impaired, and the brothers eventually suspended this enterprise. How did the Little brothers support their families in Scottsville while their liniment business was suspended? According to the Little family history per Sue Brickley of Bloomington,Minnesota, Theodore Little operated a packet boat on the James River and Kanawha Canal at the outbreak of the Civil War. The Scottsville Register, dated 07 May 1859, contained an advertisement for 'Scottsville Cash Grocery Store, T.W. & C.E. Little, Proprietors.' The Little brothers listed their grocery products as follows: "Sugar, brown, refined; coffee, crushed and granulated, or loaf; Molasses from Porto Rico; Syrup from New Orleans; Tea - Young Hyson; Coffee - Rio good, Laguayra, Java, or West India ground; Spice: Pepper, ground in papers; Cinnamon by the lb. ; Figs per box; Raisins per box; English currants; Snuff - Mackerel; Salt per sack; Starch, laundry; Starch, corn for cooking; Crackers - soda, water, butter, sweet, Fox or Boston; Chocolate - good; Concentrated Lye per box; Pickles - superior in gallon jars; Flour - Mountain, superfine and extra fine." Theodore's brother, Charles, owned a wool carding factory and broom factory in Scottsville during the War. A review of Albemarle Deed Records (Deed Book 49, p. 1) details Charles Little's purchase of Lot #134 in Scottsville from Joseph A. Ragland on 8 June 1850. According to an advertisement in the Scottsville newspaper, The Independent, 14 October 1850, Charles was also in partnership with G.W. Coleman in a blacksmith shop. According to Albemarle Deed records, Charles sold part of Lot 134 to George Coleman on 20 March 1851 (Deed Book No. 49, p. 342). Over the next 19 years, there were apparently multiple structures and various businesses on that one lot which is today on the north side of Jackson Street, and on the east side of Valley Street in the block where the Victory Theater is currently located (2015). Summing up available information, we believe that Little's wool carding factory likely was located on part of Lot No. 134. Theodore Little's business also suffered during the Civil War years, and he reportedly lost a fortune of $80,000. By 1866, the Scottsville economy was at perhaps its worst point in history due to the devastating raid on the town in March 1865 by Union General Phillip Sheridan and his soldiers. During the year after this invasion, Scottsville was having trouble getting its businesses back up and running. The town's population declined as many people moved west in search of a better life. In December 1865, Theodore and his family also made the decision to depart Scottsville and headed north, ending up in Bowens Prairie, IA, where his parents, Ebenezer and Abigail Little, had settled in 1848. 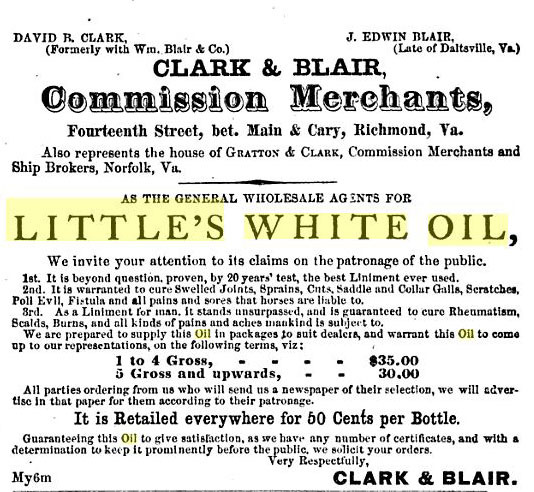 In the above advertisement, the Littles used McCabe, Craft, and Co. of Wheeling to be their sole agents to sell their White Oil in West Virginia. On 7 June 1870, Charles E. Little declared bankruptcy in the District Court of Virginia (Albemarle Co. Deed Book No. 65, pp. 255-256). Charles apparently found some means to support his family in Virginia because he stayed in Virginia until 1877 when he moved his family to Bowens Prairie, IA area, and eventually settled in Monticello, IA. Theodore White was born in Shirley, Massachusetts, on 4 July 1818 and was the son of Ebenezer and Abigail (Buttrick) Little. His brother, Charles Ebenezer Little, was born 30 March 1822 in Shirley. The two boys moved with their family to Wayne County, NY, in 1828. In 1842, Theodore moved to Scottsville, VA, and in 1846, he married Sarah Bragg in Tecumseh, MI, a girl he had known in Wayne Co., NY, before she moved to Tecumseh with her parents. Theodore and Sarah returned to Scottsville and became the parents of eight children, three of whom died in infancy (Theodore, Edward, and Abby). Their five remaining children were Frances (married Oliver Ross), Charles (married Margaret Jones), James (married Mabel Andrews), and Even and Ella, who never married. Theodore and Sarah Little remained in Bowens Prairie until 1890 when they moved to Clay County, IA, to be near their children and grandchildren. Theodore and Sarah celebrated their 50th wedding anniversary in 1896. In 1899, Sarah died, and in 1903, Theodore passed away. They are both buried in a little cemetery near Bowens Prairie where Theodore's parents, Ebenezer and Sarah Little are also buried. Charles E. Little and his wife, Ophelia, had three children: Eliza, Virginia, and Alice, all of whom died in childhood from diphtheria. Ophelia also died in Scottsville in 1862. In November 1865, Charles E. Little married Mildred Burke, and they had two daughters, Adena and Abbie, who were both born in Virginia. Charles died in 1908 in Monticello, IA, and Mildred died in 1920 in Lynchburg, VA. Both Charles and Mildred Little are buried in Monticello, IA. Scottsville Museum wishes to thank Sue Brickley of Bloomington, MN, for sharing her most interesting Little Family history research. Sue is the great-great granddaughter of Theodore Little and will be visiting Scottsville in September 2015 to see where the Littles lived and worked in the 1842-1877 time period. Additionally, we salute Jack Hamner of Palmyra, VA, who owns the two Little's White Oil bottles pictured above and the instructions and testimonials packaged with this product by the Littles. High praise is also due to Richard Nicholas of Charlottesville, VA, who researched the Albemarle Co., VA, Deed Records for primary information on the Littles of Scottsville. Richard also drew a map of Lot 134 in Scottsville and where Charles Little's wool carding factory was likely located. Thanks to Sue, Jack, and Richard, the heretofore unknown history of a successful liniment inventor and his business partner/brother in Scottsville has been recaptured for all to enjoy. 1) Original 1837 and 1848 testimonials for White's Little Oil provided Jack Hamner, Palmyra, VA.
2) Information about Theodore Little operating a packet boat on the JR and K Canal was provided by Sue Brickley of Bloomington, MN. It also appears in The History of Redwood County, Minnesota, compiled by Franklyn Curtiss-Wedge (Chicago, IL: H.C. Cooper, Jr. and . and was the son of Theodore and Sarah (Bragg) Little of Scottsville, VA.
4) Albemarle County Deed Book 49, p. 1, details Charles Little's purchase of Lot #134 in Scottsville from Joseph A. Ragland on 8 June 1850. 5) Albemarle County Deed Book 49, p. 352, details Charles Little's sale of part of Lot 134 to George Coleman on 20 March 1851. 6) Richmond Daily Dispatch, Vol. 25, No. 116, 18 November 1863, contained article regarding the destruction of Charles Little's wool carding factory by fire. 7) Albemarle Deed Book 60, pp. 389-390, also captured the 26 April 1864 transaction where Charles E. Little sold 29 acres	of land along Scottsville's Hardware Street to the Scottsville Presbyterian Church for their use and benefit as a parsonage and cemetery. This land had been purchased by Charles Little from Peter and Elizabeth White on 6 June 1862 (Albemarle Deed Book 59, pp. 692-693). 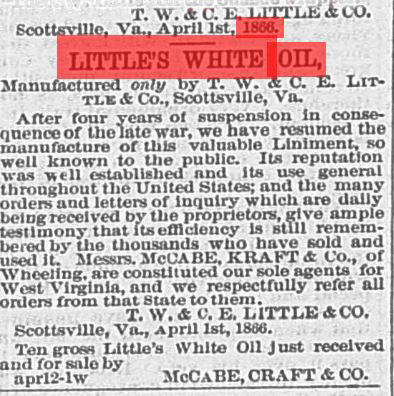 8) Wheeling Daily Intelligencer, Wheeling, WVA, dated 12 April 1866, contains advertisement for Littles' White Oil with McCabe, Craft, and Co as the Littles' sole agents in WVA. 9) Scottsville Register, 02 November 1867, contained article by Editor J.L. Brady wrote on C.E. Little of Scottsville. 10) De Bow's Review, Devoted to the Restoration of the Southern States and the Development of the Wealth and Resources of the Country, 1867, Editors B.G. Barnwell and Edwin Q. Bell, p. 384. 12) The History of Jones County, Iowa (Chicago: Western Historical Co., 1879), p. 690. 13) History of the Town of Shirley, Massachusetts, by Seth Chandler (Shirley, MS: 1883), p. 502-513. 14) Genealogy of the Theodore and Charles Little families was provided by Sue Brickley of Bloomington, MN.